Mercy is not a subject that perhaps springs naturally to the lips of the English constitutional historian. Our traditions and training are focused on justice: that is, on the development of a rational, formal and increasingly secularised system of law operated through an expanding network of courts that sought, on the criminal side, to preserve public order and, on the civil side, to allow private parties to resolve disputes through peaceable process and definitive judgment. And yet the study of the apparatus of medieval justice is nothing without an understanding of the quality of mercy. 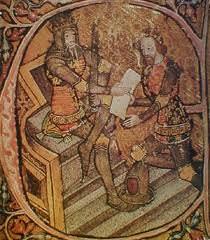 A host of text – from the scholastic tradition via the mirrors for princes to political polemic and imaginative literature – pay repeated and consistent testimony to the medieval view that one cardinal virtue, Justice, had constantly to be tested by another, Charity, and tempered by pity and mercy.